All is fair in love and war. When Mr Darcy hears that Miss Elizabeth Bennet has taken refuge from her family’s troubles and her own rebellious heart in Scotland , he quickly decides his good friend Lord Baugham is in urgent need of some solitary reflection, complemented by his own soothing company, at his Lordship’s country estate nearby. Mr Darcy’s well-laid plans and swift advance, however, have very unexpected consequences for his host and for Elizabeth Bennet’s cousin, Miss Holly Tournier. 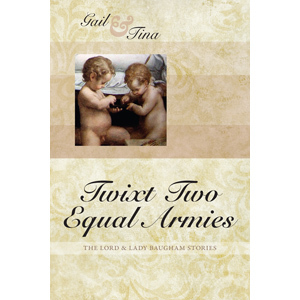 Twixt Two Equal Armies is the first story in the Lord and Lady Baugham series and recounts how the two met, behaved most uncivilly and unexpectedly towards one another but ended up entrusting their life, love and happiness to the other’s keeping for the rest of their days.